To hire one of our vehicles, you need to fill out and return a booking form and pay a deposit of £500+VAT. Download the booking form from the link below in the format that suits. Then either email or fax it back to us at transport@mattsnowball.com or +44 (0)20 7700 6990. We also need details of who will be driving the vehicle so please complete and return the driver form below before your hire starts. This can also be emailed or faxed to the number above. Deposits are usually returned within 3 working days of the safe return of the vehicle. Please ensure you have read our Terms & Conditions before booking. You can either collect from our main office near Kings Cross in North London, our other warehouse in West London or have the van delivered to your door! Please complete and return the driver form first. We only have limited forecourt parking at Brewery road so unfortunately you cannot leave your car with us during your hire. Most people find the easiest way to travel to us is on the Underground using the Piccadilly line to Caledonian road which is just one stop away from Kings Cross. See our how to find us section. Please remember to bring both parts of your driving licence! You can return your vehicle at any time before your hire is due to end, please let us know if you’re going to return early. Most hires end at 10.00 am on the morning following your last hire day (check your rental agreement), please ensure you return no later than 10.00 am. 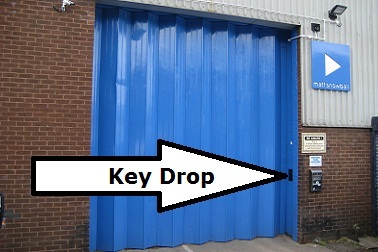 We have an out-of-hours key drop facility which most people prefer to use, saves you getting up early to drop the van off in the morning! Please make sure you fill your vehicle up with diesel before returning, there are two 24 hour fuel stations marked on the right hand map. If you return outside of our opening hours you will need to make sure you park the vehicle correctly. We will be not be open until 10.00 am, until then you’re still responsible for the vehicle. Please do not park where the vehicle will receive a parking ticket and please do not park on our neighbours forecourts. 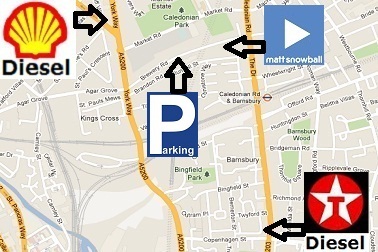 We have 5 parking spaces available on our forecourt, see drawing on right hand side. Please park in the first space available space starting at number 1. If all our parking spaces are full then you can park on the road if the controlled parking does not come in to force the following morning. There is controlled parking on Brewery road during the hours of 09.30 – 16.30 Monday to Friday and on match days when Arsenal are playing at home, check their fixtures here. 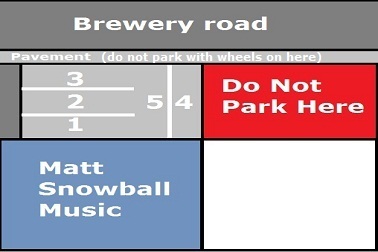 Alternatively you will have to park in a pay and display bay which is further down Brewery road, see drawing. You will need to pay for the van to be parked for the following morning up until 10.30 am. You can either pay cash or on card over the phone using an automated service, tel: 020 7005 0055. If you do have to leave the van in a pay and display bay then please call us on 020 7700 6555 and leave a message on our answer machine to say where the van has been parked. Please make sure all deadlocks are locked on the van doors before posting the keys in the key drop drawer. Please see photo on right hand side for key drop location. If you require a taxi home you can call a local cab company on: 020 7281 4242. Your vehicle will normally be checked back in when you return it however this is not always possible at busy times. We will check it back it in as soon as possible and will contact you if we find any new damage. If you return out-of-hours the vehicle will be checked back in the following morning. If you know your vehicle has been damaged whilst out on hire to you please let us know as soon as possible.